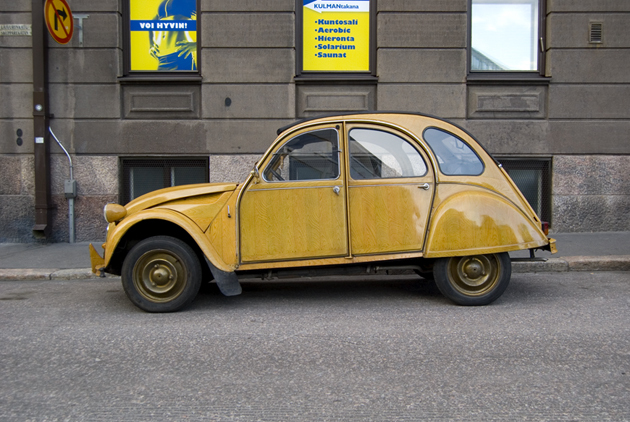 This Citroën 2CV or “deux chevaux” always conjures up scenes from French films but I found this utilitarian, wood-grained beauty on the streets of Helsinki. I wonder if this car belongs to former Finnish Citroën rally driver, Ari Vatanen? Maybe he’s at the kuntosali working out? Speaking of French films, I watched the excellent Diva last night about a young French mail courier who loves the opera and making bootleg tapes. His audio recording becomes mistaken for a tape that would implicate a police chief involved with the mob. It all makes for a very New-Wave thriller complete with an exploding 11-horsepower Citroen Traction Avant 11B and mirror-sunglassed Taiwanese gangsters. The chase scenes are very reminiscent of another film favorite of mine, The French Connection.